The ScrapeBox Rapid Indexer addon offers a unique way to quickly and easily index your sites or backlinks in the search engines. It does this by creating pages on various statistics and whois sites (example http://websiteshadow.com/www.domain.com), and these pages in turn have links back to your site. The statistics and whois sites are typically crawled heavily by search engine spiders and they crawl the links back to your site so your new domain is quickly discovered. Also the Rapid Indexer can also be used to assist with reputation management, because pages containing your site name and other details are created on many high profile domains these pages can rank for searches of your domain or brand. This can help push negative pages about your site out of the top search results for your domain, and replace them with the various statistics pages created with the Rapid Indexer. The Rapid Indexer comes with a list of 2,500 indexer sites, and this is editable by you so you can add or remove any sites you like. 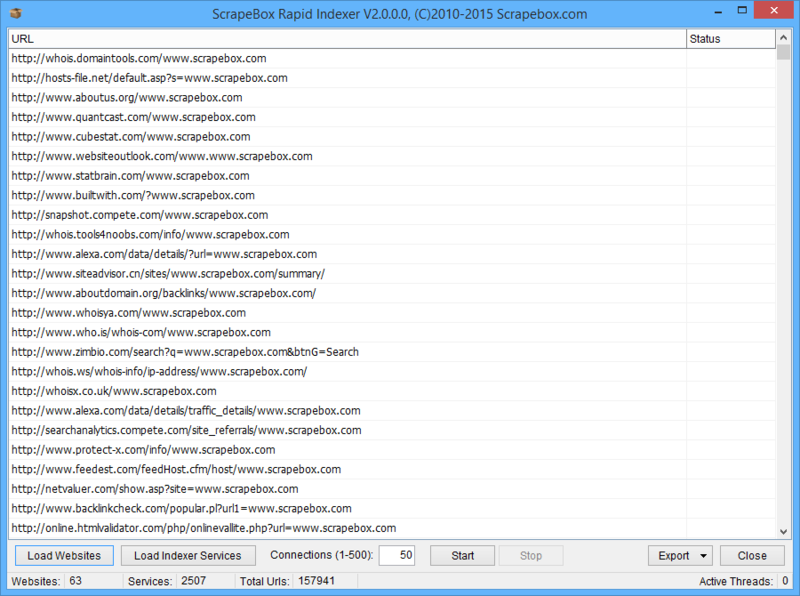 Also ScrapeBox users have shared numerous lists some in excess of 100,000 urls. Check this Google Search for shared lists. So if you need to get URL’s, new domains or backlinks indexed fast then the Rapid Indexer is a simple method of doing this along with things like the Sitemap Creator and the RSS Submit feature to submit your created sitemaps. View our video tutorial showing the Rapid Indexer in action. This is a free addon included with ScrapeBox, and is also compatible with our Automator Plugin.